Ousmane Touré, generally known as DJ Fof, is a gold digger in Mali and dreams of a better life. He runs a small bar with his wife Ami at Baboto, near Didjian. 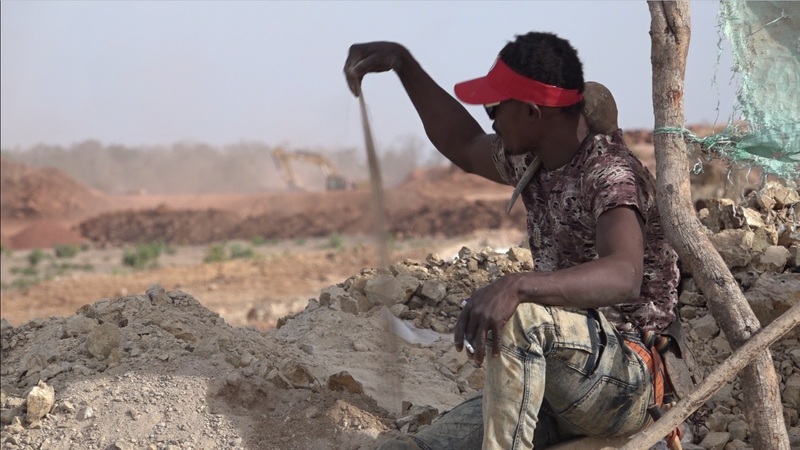 Didjian is a mining town in western Mali that has been flourishing for 20 years thanks to Randgold, a multinational company that operates a large gold mine there. Randgold’s presence has created a lot of jobs, but also jealousies, and sometimes conflicts between some villagers – who live fairly comfortably from the wealth derived from the mine – and some artisanal gold miners – who also live on the proceeds of gold, but digging at the risk of their lives. Like many young Malians, DJ had the gold fever. He led a life of hard work and freedom dreaming of the gold vein that would allow him to manage his own nightclub. But like many others, he earns only a few grams of gold per month (about £50 to £75). Rich gold veins are rare, too rare. Ousmane no longer wants to earn gold, but money. He undertakes to get himself hired by Randgold in order to have a fixed salary, and thus improve the living conditions of his wife and three children…. Jérôme Poisson, 40 y.o., is a geologist and has worked during several years for various mining companies, particularly on prospecting for gold in West Africa. He lives in Bamako where he coordinates cartographic and geological studies. Having ranged among the diverse gold mines in West Africa, he has been writing and developing since 2016 “Gold or Money”, a documentary film project on gold mining in Mali. Eric Rivot, 41 y.o., studied cinema and photography in Louis Lumière High School. Living in Mali since 2005, he has been working in West Africa in collaboration with Souleymane Cissé and the CNCM. In 2011, his first short film « Drogba is dead » is selected in Clermont-Ferrand and Fespaco, awarded in Barcelona and broadcasted by Arte. In 2015, he directed « Action for Green Africa« , selected in Montreal, Sydney and special mention in Vues d’Afrique. L’Échangeur développe des projets de films documentaires portés par des auteur-e-s qui questionnent les enjeux sociopolitiques de l’Afrique contemporaine.